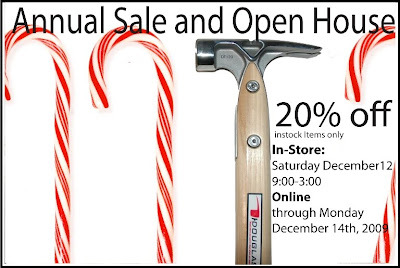 Join us for our Annual Sale and Open House on Saturday December 12, 2009 from 9:00-3:00. We'll have tool demonstrations, refreshments, workshop tours and a free tool drawing. If you cannot make it into the store on Saturday the sale is available online through midnight on December 14th, 2009. Sale applies to in-stock items only. This offer cannot be combined with other discount.